Since early 2015, more than 10,000 people have been killed, many more wounded and 2 million driven from their homes because of the fighting between a Saudi-led coalition (composed of the Emirates, mercenaries, and a hodgepodge of militiamen including jihadis) and Iranian-backed Houthi rebels. For most people, death comes from above, with warplanes from a Saudi-led alliance constantly sweeping the skies. Meanwhile, a full three-quarters of the population, roughly 22 million people, rely on aid, and 8.4 million of them are facing famine. Adding to the misery, the country has been plagued by the largest cholera epidemic in recorded history, with 1 million suspected cases, according to the World Health Organization. Behind every bomb dropped in the nearly 17,000 air strikes by the Saudi-led coalition on Yemen are support services provided by the U.S.
At the behest of lucrative arms deals worth billions of dollars (Saudi Arabia alone spent $69.4 billion on arms in 2017, according to the Stockholm International Peace Research Institute, giving it the world’s third-largest military budget), the U.S. supplies much of the hardware used by the Saudis and Emiratis, while also offering midair refueling and general intelligence sharing. 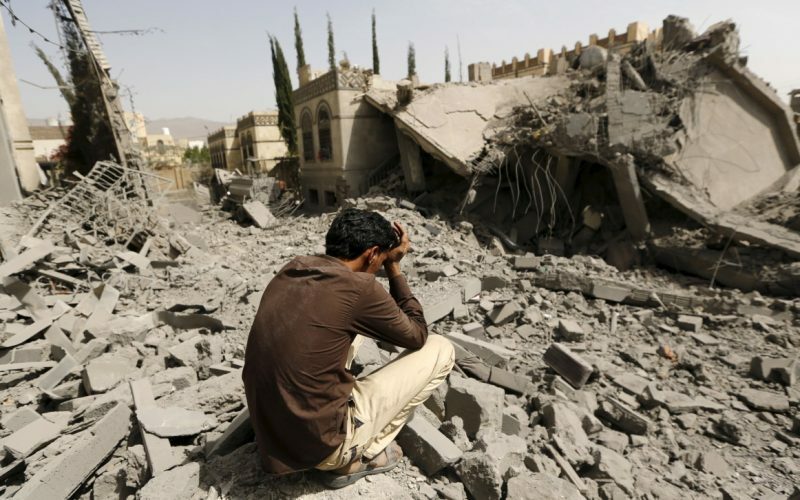 “The U.S government is complicit in the suffering of civilians in Yemen,” said Samah Hadid, Amnesty International’s director for Middle East campaigns. “Through irresponsible arms transfers to the Saudi-led coalition, U.S.-manufactured weapons have been used to kill civilians. Yet the Houthis, though they are backed by Iran, pose little direct threat to the U.S. and are not listed as a terrorist entity. And the U.S. appears to have stepped up its activities in the country. The New York Times reports that a contingent of Green Berets is now stationed on the Saudi side of the border with Yemen in a bid to secure it against the Houthis. The involvement continues despite heightened scrutiny from U.S. lawmakers. In February, the Senate blocked a resolution that would have ended U.S. participation in the war in Yemen, but legislative efforts to do so are ongoing. “I have strong concerns that the Trump administration is getting the U.S. more involved in a war in Yemen without congressional authorization,” Sen. Bernie Sanders tweeted in May. With all the focus on Islamic State, it’s easy to forget that al-Qaida is still hanging around. Yemen is not only home to the group’s most dangerous franchise, al-Qaida in the Arabian Peninsula, but also where it pulled arguably its greatest triumph: In 2015 the jihadis took over Mukalla, Yemen’s third-largest port. The port became the centerpiece of a Qaida fiefdom, comparable to Islamic State’s so-called capitals of Raqqah and Mosul. It boasted $100 million in bank deposits, and the jihadis even sought to export crude oil, according to a Reuters report. The group administered the city’s affairs for the year it was in control, before abandoning Mukalla to United Arab Emirates troops and government loyalists. Meanwhile, U.S. special forces using drones have for years hunted suspected al-Qaida operatives throughout the country with mixed success (one raid in 2017 killed up to 25 civilians, including a number of children, according to the Bureau for Investigative Journalism), even as the CIA and Pentagon conduct dozens of drone strikes that many say have created more enemies than they destroyed. Ironically, the strikes may be against a de facto U.S. ally, since al-Qaida fighters have joined the Saudi-led coalition to fight the Houthis. And many of the weapons given to Saudi Arabia have found their way to al-Qaida militants, said Farea Muslimi, an associate fellow at the U.K.-based Chatham House think tank and co-founder of the Sanaa Center. A $350-billion arms deal between Saudi Arabia and the U.S. has further inflamed anti-U.S. sentiment in Yemen. “As long as the U.S. is helping to fan the flames of war or as long as they’re doing more to support the war rather than support for diplomatic efforts to end it, (Al Qaeda) is being inadvertently bolstered,” said Adam Baron, visiting fellow at the European Council on Foreign Relations. And, yes, Islamic State also has a presence in Yemen. With almost 1,200 miles of coastline, Yemen sits at the intersection of some of the world’s busiest sea lanes. The southern Yemeni city of Aden, home to the country’s largest port, is an important way point between on the Indian Ocean (although decades of political instability have prevented it from taking full advantage of its location). The Bab al-Mandab Strait, an 11-mile wide waterway between Yemen and Djibouti that is the Red Sea’s southern gate, links the Indian Ocean to the Mediterranean and handles 8 percent of the world’s seaborne trade in oil, according to the Journal of the Indian Ocean Region. With so much shipping tonnage around, it is little wonder the area has long been an irresistible target for pirates. And although maritime shipping security has improved in the last few years, unrest in Yemen means that hundreds of miles of the country’s sparsely populated coastline could be used as staging grounds for attacks on ships.